Posted on November 6th, 2007 by jayKayEss. OK, well actually the WFMU record fair was last weekend. And none of these is particularly new. But the upshot is that I bought a ton of records– here’s some of the best tracks so far. No photos yet, because I’m too lazy and I need sunlight to do it anyway. Posted on September 30th, 2007 by jayKayEss. The Melachrino Orchestra – To the Girls! Posted on March 18th, 2007 by Scooter. Posted on May 18th, 2006 by jayKayEss. Posted on April 25th, 2006 by Scooter. Posted on April 5th, 2006 by jayKayEss. 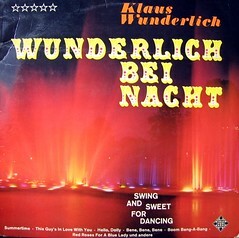 I don’t know about you, but the mere fact that Klausie’s last name sounds like “Wonderful” is enough to make this record one of my favorites. And, are there any sweeter words in the German tongue than “Hammondorgel mit Rhythmusgruppe”?! I think not. 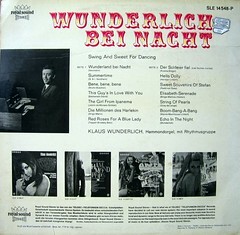 Some great tracks here; an upbeat version of “Summertime” from Porgy and Bess, the old standard “The Girl From Ipanema” in organ form, and the surprisingly haunting original composition “Echo In The Night.” (Now, if I could only track down a copy of “Organ Happening”…) Enjoy! Posted on March 29th, 2006 by jayKayEss. Is your insatiable organ-lust at peak intensity? 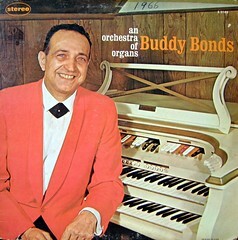 Has the thrill of just one organ long ago faded? Do you crave more and more– your harmonic intensity increasing– until you burst forth in a melodic cascade of organ ecstasy?! 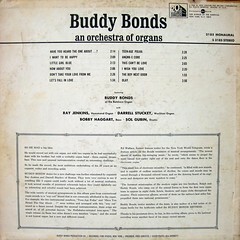 Well, wait no longer, because Buddy Bonds has heard your prayers! Posted on March 26th, 2006 by Scooter. There are no credits on the album whatsoever–nobody will own up to creating this masterpiece, except for Winston Jones, the “leader.” Which happy, be-ponchoed dude in a colorful silly had is he? Alas, we’ll never know. All we know is that this records contains 12 of our most beloved tunes rendered in none other than– steel drums! Each cut is a voyage of multiculturalism as we hear Caribbean rhythms and sounds bang out “Paris Mambo,” “Spanish Eyes,” “Guantanamera,” and of course, the staple of all records done in the ’60s, Offenbach’s “Barcarolle” from Tales of Hoffman. Crank up this album in the dead of winter when you yearn to be on a golden beach under palm trees with a bunch of guys with brightly-colored maracas emblazoned across their chests smiling at you. Posted on March 26th, 2006 by jayKayEss. 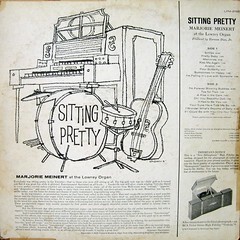 Here’s a light, dreamy album packed with a whopping sixteen tracks of organy goodness. 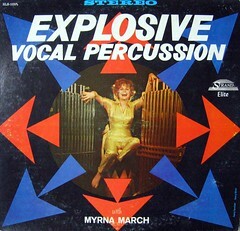 Marjorie seems to have been one of the major players of the 60’s organ scene, with at least 7 LPs to her name that I can find online. 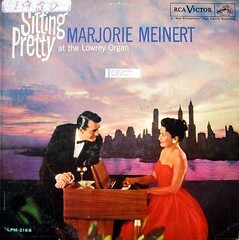 Here, Marjorie’s playing the Lowrey Organ, which according to Wikipedia was one of the first transistorized organs, and which apparently she was a spokeswoman for. The Lowrey here has a lighter, more etherial quality than the Hammond, and some of the tracks have cool guitar and vibraphone arrangements woven in. A sweet, swingin’ album with a nice upbeat tempo throughout.